A DVD of Interactive Studies is included. -Side-by-Side Figures provide students with multiple views of the same structure, typically pairing an artist's drawing with a cadaver photograph. This approach allows students to compare the illustrator's rendering with a photo of the actual structure as it may be seen in the laboratory or operating room. -Macro-to-Micro Figures help students to bridge the gap between familiar and unfamiliar structures of the body by sequencing anatomical views from whole organs or other structures to their smaller parts. A typical illustration might combine a simple orientation diagram (indicating where an organ or structure is located in the human body) with a large, vivid illustration of that organ or other structure, a corresponding cross-sectional view, and a photomicrograph. -llustration-over-Photo Figures, in addition to being visually dramatic with their 3D effects, teach realistic body proportions and structure placement. -Learning Outcomes on each chapter-opening page indicate to students what they should be able to do after studying the chapter. These Learning Outcomes are coordinated by number to the chapter headings, allowing students to check their understanding by both Learning Outcomes and chapter topics. -Full-sentence chapter headings do more than introduce new topics: they state the core fact or concept that will be presented in the chapter section. These numbered chapter headings are directly correlated to the numbered Learning Outcomes found on the chapter-opening page, making it easy for students to see, navigate through, and learn the chapter content. -Vocabulary Development sections kick off each chapter, listing the important word roots that form the basis of the specialized terminology in the chapter. -Checkpoint questions appear at the end of each section, closing out each major topic. Each Checkpoint checks student understanding of important facts and/or concepts according to what students most need to remember from the section in the chapter. The Checkpoints reinforce the Learning Outcomes listed on the chapter-opening page, resulting in a systematic integration of the Learning Outcomes over the course of the chapter. Students can instantly check their responses to these questions against the answers located at the back of the book. -Concept Links, signaled with blue arrow icons, alert students to material that is related to, or builds upon, previous discussions. Each link refers students to a page number for quickly reviewing the relevant material from an earlier chapter. -Clinical Notes appear within every chapter and present information on diseases and disorders to prepare students for future workplace situations. -Career Paths are interview-based vignettes that showcase 11 healthcare professionals. They appear at the end of each body system. The following professions are featured: emergency medical technician (EMT), dental hygienist, massage therapist, physician assistant, physical therapist, phlebotomist, pediatric nurse, respiratory therapist, registered dietitian, pharmacy technician, and sonographer. 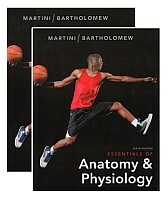 -The Big Picture boxes succinctly organize core concepts in anatomy & physiology at salient points in a chapter. These factual statements provide students with the key concepts that they should remember five years after their anatomy & physiology course, regardless of the specific career path they pursue in the future. The interactictive DVD takes the place of on-line learning materials. On-line materials are available for an additional fee.